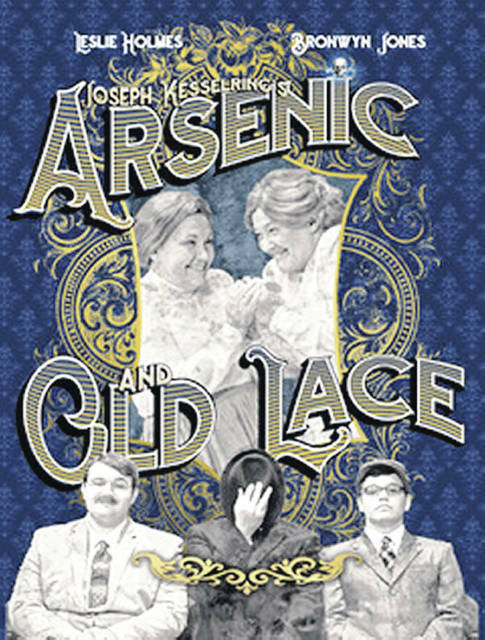 The Southern State Community College Theatre Company presents Joseph Kesselring’s “Arsenic and Old Lace,” playing Nov. 2-4 in the Edward K. Daniels Auditorium on Southern State Community College’s Central Campus, 100 Hobart Dr., Hillsboro. The Friday and Saturday performances begin at 7:30 p.m.; the Sunday matinee begins at 3:30 p.m. If you’re a lonely, elderly gentleman, steer clear of the old Victorian rooming house that Abby and Martha Brewster (played by Leslie Holmes and Bronwyn Jones) run – it may be your last room on earth! The charming and sweet old sisters populate their cellar with the remains of socially and religiously “acceptable” roomers. Add to this the antics of their nephew who thinks he’s Teddy Roosevelt (Zebadiah Pickering-Polstra), another who is disfigured and insane (Andrew Marler), and yet another who is lovesick (Shane Taylor)… well, you have a recipe for mayhem and hilarity. The cast includes Justin Hatfield, Madison Hatfield, Aidan Holmes, Mark Holmes, Quinn Pickering-Polstra, Jonathan Stewart, Shawn Thomsen, Matthew Waits, and Terry Washburn. The production team includes Rainee Angles (director), Brent Angles and Rainee Angles (production design), Zanna Haines (costumes), Benjamin Gullett (public relations), Paula Campagna (stage manager), and Faith Fetters (assistant stage manager). Crew members include Laura Bradley, Charlotte Brown, D.J. Griffith, Melissa Griffith, Ian Holmes, Emma Horick, Jackson King, William Stewart, and Sarah Wuellner. Tickets for “Arsenic and Old Lace” can be purchased for $8 at www.sscctheatre.com. At the door, tickets start at $10. A discount of $2 per ticket is available for groups of 10 or more. Credit cards are accepted for online purchases and at the door. Seats for this production are reserved; therefore it is recommended that tickets be purchased early. For more information about “Arsenic and Old Lace,” please visit www.sscctheatre.com.